To study the expression of breast cancer susceptibility gene 1 (BRCA1) and Ki-67 in young patients with breast cancer and the clinical research significance, and discuss the pathology classification of breast cancer. And a total of 218 patients are investigated as experiment for clinical study. Patients with early clinical stages I and II breast cancer were recruited across the West Midlands, and were randomized to immediate postoperative radiotherapy or follow-up only, as results of the expression of BRCA1 in breast cancer tissue and clinical pathological indicators of positive are 6, 28, 5, while the expression of negative are 3, 34 and 21, respectively. And it was found that alcohol consumption did not increase the risk of breast cancer among women with a BRCA1 or BRCA2 mutation. Increasing consumption of wine was associated with a modest reduction in the risk of breast cancer among women with a BRCA1 mutation. Pathology classification, Clinical research, Breast cancer, Gene expression. As known to all, Breast Cancer (BC) [1-3] patients with hepatic metastases are in a tough situation in terms of management. Only a few reviews have investigated the clinical outcome of this group, and a median survival within 3-14 months has been reported. In contrast to the Western countries, where the incidence rate of BC has been stabilized or even decreased [4,5-8], but an elevation in incidence rate has been identified in most Asian countries over the past two decades. Changes in reproductive factors, environmental exposures, and lifestyle, such as dietary intake and physical activity, have all been considered as the risk factors contributing to such a phenomenon. With the westernization of some Asian countries, this trend will continue, and there is no doubt that soon, breast cancer patients will be dominated by Asians. Therefore, it is crucial to improve our understanding of breast cancer among Asian women. Clearly, elderly patients will account for an increasing proportion of breast cancer patients in routine clinical practice over the years to come. The optimal treatment strategy in this population has been insufficiently documented. Most trials on conservative therapy for BC have excluded patients over the age of 70 y, and postoperative Radiotherapy (RT) [9-13] remains the standard protocols for patients in stages I and II of breast cancer to ensure optimal local control. Therefore, the aim of this paper is to detect the expression of BRCA1 and Ki-67 in young patients with breast cancer, investigate the clinical research significance, and discuss the pathology classification of breast cancer. Patients with early clinical stages I and II breast cancer were recruited across the West Midlands, and were divided to immediate postoperative radiotherapy or follow-up only. Those receiving radiotherapy were further divided between long- and short-course radiotherapy fractionation. Women were eligible if they had histologically proven adenocarcinoma of the breast that had been completely surgically removed resulting in a cosmetically satisfactory breast; clinical tumor measurement had to be less than 5 cm with no clinically palpable axillary nodes and no evidence of systemic disease. Eligible patients were required not to have had any previous malignancy (excluding basal cell carcinomas of the skin and in situ carcinoma of the cervix) and had received no previous radiotherapy or chemotherapy. Attempts were made to achieve a wide local excision with an acceptable cosmetic result. Axillary sampling was not standard practice at the time and was not recommended. After excision, the local pathological histological report was recorded and subsequently a central histological review of 218 specimens carried out. A four-field technique was used to irradiate the breast and ipsilateral axillary, supraclavicular lymph nodes using isocentric megavoltage equipment with the patient in a stationary, supine position with the arm abducted to 90º. Reference planning films of supraclavicular and medial tangential breast fields were used. Field edges were matched to the 50% isodose and the posterior axillary field supplemented the anterior component of the large supraclavicular field. It uses SPSS 17.0 software (SPSS Inc., Chicago, IL), the group was asked to count variable with using rank and inspection, do the classification of related factors are in order variable logistic regression analysis, and P<0.05 for the difference was statistically significant. Survival analysis was first performed on all randomized patients, but again excluding patients who had already progressed at the time of randomization. A sensitivity analysis was done for survival based on all patients regardless of whether they had already progressed or not at the time of randomization. In total, 3283 primary operable breast cancer patients were divided to one of the trials. Of these patients, 3012 breast cancer patients were deemed eligible. 3648 patients had cT1 or cT2 tumors [14-16] and were subsequently included in the analysis. At the time of the analysis, the median follow-up period in this subset of patients was 11 y, 1016 patients have died, and 314 patients have developed a loco regional recurrence as their first event. Other patient characteristics are listed in Table 1. 1836 patients (55.9%) underwent breast-conserving therapy. Breast-conserving therapy consisted of lumpectomy and axillary lymph node dissection followed by adjuvant radiation therapy. 1726 patients underwent a modified radical mastectomy. Table 1. Characteristics of patients. Seeing in Table 1, the stage of characteristics of patients for mastectomy are 47%, 43%, 76% respectively, total of 51%, and the Breast-Conserving Therapy (BCT) of general guidelines concerning adjuvant radiotherapy were as follows: for patients both after mastectomy or breast-conserving therapy, irradiation of the parasternal lymph node region was indicated for patients with a centrally or medially localized tumor and for patients with a lateral tumor and histologicallyproven axillary lymph node metastases. Postoperative radiation was always given in cases in which surgery was considered not to be radical. In case of the Chemotherapy (CT) that it not adjuvant are 83%, 45% and 0, total of 51%, and adjuvant CT are 20%, 61%, 98% respectively, total of 53%. As Q-TWiST analysis  of preference was performed based on all patients, but again excluding patients who had already progressed at the time of division. The Q-TWiST analysis was proposed originally for the evaluation of early breast cancer treatment. Different states are given utilities or values in the analysis (Figure 1). Figure 1. 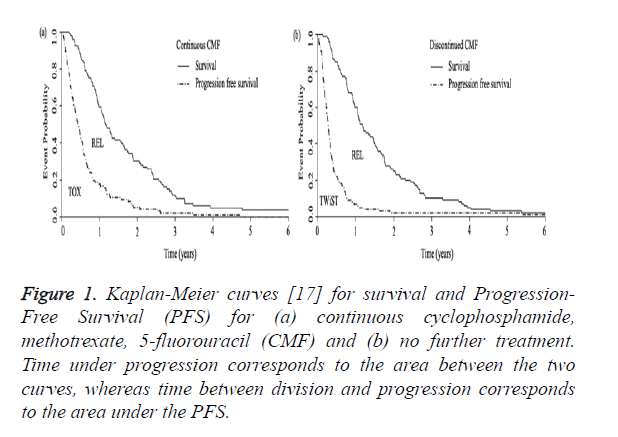 Kaplan-Meier curves  for survival and Progression- Free Survival (PFS) for (a) continuous cyclophosphamide, methotrexate, 5-fluorouracil (CMF) and (b) no further treatment. Time under progression corresponds to the area between the two curves, whereas time between division and progression corresponds to the area under the PFS. As seen that the Table 2 of the expression of BRCAl in breast cancer tissue and clinical pathological indicators, the tumor size is divided for three grade (≤ 2, 2~5, >5), and the histologic classification, the case number of histologic classifications I-III that are 9, 62, 26 respectively, and the expression of positive are 6, 28, 5 respectively, while the expression of negative is 3, 34, 21 respectively. Table 2. The expression of BRCAl in breast cancer tissue and clinical pathological indicators. In conclusion of the expression of BRCAl in breast cancer tissue and clinical pathological indicators that among women with a BRCA1 mutation, current alcohol consumption was more common among controls than among the cases. In a multivariable model, the odds ratio for breast cancer associated with current alcohol consumption, and a significant trend of decreasing risk with increasing drinks per week was observed. As known the relationship of BRCA1 and Ki-67 expression in breast cancer tissue and clinical pathological index: Ki-67, BRCAl protein expression and organization classification, and rain curry favor with transfer, proto-oncogenes epidermal growth factor receptor 2 (Her-2) expression in the relevant, with increased histologic grading, known as BRCAI expression reduced, higher expression of Ki-67, lymph node metastasis is, the low BRCAl expression, expression of Ki-67, was its Her-2 expression, low BRCAl expression, expression of Ki-67, as shown in Tables 2 and 3. Table 3. The expression of Ki-67 in breast cancer tissue and clinical pathological indicators. The tissue observation of expressions of BRCA1 and Ki-67 in multicentric breast cancer and shown in Figure 2. As we known that each section according to the shaded cells number<10% is negative, ≥ 10% is positive [18-20], ER, PR, Ki67, P53 are tan granule is positive nucleus appeared, Nm23 tan granule is positive for the cytoplasm appeared, it’s HER-2 tan granule is positive for the cell membrane. Figure 2. 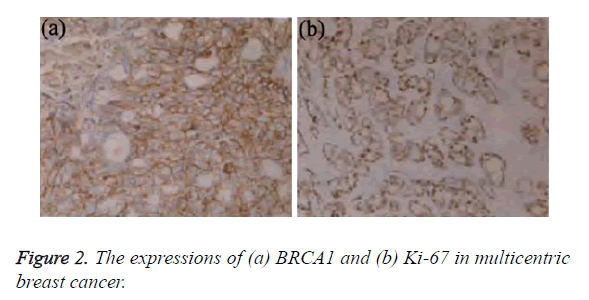 The expressions of (a) BRCA1 and (b) Ki-67 in multicentric breast cancer. To extended knowledge, this is one of the largest multi-ethnic collaborative studies in Asia assessing the presentation, management and survival following breast cancer among Asian women. However, we do acknowledge that this study suffers from limitations. While Malaysia is an upper-middle income nation, China is a high-income nation, making populations heterogeneous from socioeconomic perspectives. However, the two hospitals in this study are tertiary academic centers with comparable diagnostic and therapeutic facilities. As conclusion of this study that results of our study point to the need for a revision of the optimal management of BC patients with liver metastases alone, given that the detection of this small subset of BC patients is now facilitated and that a median survival of more than 2 y can be achieved with modern chemotherapy. Optimism is fed by the fact that there is level III evidence supporting the hypothesis that MBC might be curable with a multidisciplinary approach in highly selected patients with limited metastases. And it found that alcohol consumption did not increase the risk of breast cancer among women with a BRCA1 or BRCA2 mutation. Increasing consumption of wine was associated with a modest reduction in the risk of breast cancer among women with a BRCA1 mutation. The possible protective effect of wine found in this study is in accordance with some, but not all studies of women in the general population and provides support for the potential role of resveratrol in BRCA1- associated breast cancer chemoprevention. Further studies in this area are needed to confirm this apparent protective effect of wine consumption against breast cancer among women with a BRCA1 mutation. Wenger CR, Beardslee S, Owens MA, Pounds G, Oldaker T. DNA ploidy, S-phase, and steroid receptors in more than 127,000 breast cancer patients. Breast Cancer Res Treat 1993; 28: 9-20. Bonnier P, Romain S, Charpin C, Lejeune C, Tubiana N, Martin PM. Age as a prognostic factor in breast cancer: relationship to pathologic and biologic features. Int J Cancer 1995; 62: 138-144. Remvikos Y, Gerbault-Seureau M, Magdelenat H, Prieur M, Dutrillaux B. Proliferative activity of breast cancers increases in the course of genetic evolution as defined by cytogenetic analysis. Breast Cancer Res Treat 1992; 23: 43-49. Holli K, Isola J. Effect of age on the survival of breast cancer patients. Eur J Cancer 1997; 33: 425-428. National Institutes of Health Consensus Development Panel. National Institutes of Health Consensus Development Conference Statement: Adjuvant Therapy for Breast Cancer, November 1-3, 2000. J Natl Cancer Inst 2001; 93: 979-989. Extermann M, Balducci L, Lyman GH. What threshold for adjuvant therapy in older breast cancer patients? J Clin Oncol 2000; 18: 1709-1717. Guadagnoli E, Shapiro C, Gurwitz JH, Silliman RA, Weeks JC, Borbas C. Age-related patterns of care: evidence against ageism in the treatment of early stage breast cancer. J Clin Oncol 1997; 15: 2338-2344. Nemoto T, Patel JK, Rosner D, Dao TL. Factors affecting recurrence in lumpectomy without irradiation for breast cancer. Cancer 1991; 67: 2079-2082. Ibrahim NK, Buzdar AU, Asmar L, Theriault RL. Doxorubicin-based adjuvant chemotherapy in elderly breast cancer patients: the M.D. Anderson experience, with long-term follow-up. Ann Oncol 2000; 11: 1597-1601. Grosclaude P, Colonna M, Hedelin G, Tretarre B, Arveux P. Survival of women with breast cancer in france: variation with age, stage and treatment. Breast Cancer Res Treat 2001; 70: 137-143. Veronesi U, Banfi A, Salvadori B, Luini A, Saccozzi R. Breast conservation is the treatment of choice in small breast cancer: long-term results of a randomized trial. Eur J Cancer 1990; 26: 668-670. Wildiers H, Kunkler I, Biganzoli L, Frachebond J, Vlastos G. Management of breast cancer in elderly individuals: recommendations of the International Society of Geriatric Oncology. Lancet Oncol 2007; 8: 1101-1115. Hughes KS, Schnaper LA, Berry D, Cirrincione C, McCormick B, Shank B. Lumpectomy plus tamoxifen with or without irradiation in women 70 years of age or older with early breast cancer. N Engl J Med 2004; 351: 971-977. Cutuli B, De Lafontan B, Vitali E, Costa L, Aristei C, Marchal C. Breast conserving treatment (BCT) for stage I-II breast cancer in elderly women: analysis of 927 cases. Crit Rev Oncol Hematol 2009; 71: 79-88. Whelan T, Mac Kenzie R, Julian J, Levine M, Shelley W. Randomized trial of breast irradiation schedules after lumpectomy for women with lymph node-negative breast cancer. J Natl Cancer Inst 2002; 94: 1143-1150. Campana F, Kirova YM, Rosenwald JC, Dendale R, Vilcoq JR. Breast radiotherapy in the lateral decubitus position: A technique to prevent lung and heart irradiation. Int J Radiat Oncol Biol Phys 2005; 61: 1348-1354. Whelan T1, Mac Kenzie R, Julian J, Levine M, Shelley W. Randomized trial of breast irradiation schedules after lumpectomy for women with lymph node-negative breast cancer. J Natl Cancer Inst 2002; 94: 1143-1150. Ortholan C, Hannoun-Levi JM, Ferrero JM, Ferrero JM. Long-term results of adjuvant hypofractionated radiotherapy for breast cancer in elderly patients. Int J Radiat Oncol Biol Phys 2005; 61: 154-162. Courdi A, Ortholan C, Hannoun-Levi JM, Ferrero JM. Long-term results of hypofractionated radiotherapy and hormonal therapy without surgery for breast cancer in elderly patients. Radiother Oncol 2006; 79: 156-161. Miller BA, Hankey BF, Thomas TL. Impact of sociodemographic factors, hormone receptor status, and tumor grade on ethnic differences in tumor stage and size for breast cancer in US women. Am J Epidemiol 2002; 155: 534-545.